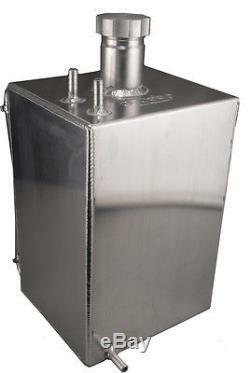 2 Gallon Square Aluminium Foam Filled Fuel Tank OBPFT010. Size: 300mm (H) x 180mm (W) x 200mm (L). 10mm O/D Outlet, Breather, Return with a Screw Cap Filler and Sight Glass. Obp Motorsport alloy fuel tanks are precision made for competition or road use. The tanks are filled with a baffle foam to help prevent fuel surge and suppress explosion. Upon order, please confirm what fuel you will be using in the fuel tank. Unless stated otherwise on order, the tank will be filled with foam for petrol. Obp Motorsport innovates race car and performance products we do not imitate. Not many companies can offer all of the following. Proactive Improvement Of Our Products. Massive Stock Ready To Dispatch. Always look for the obp trade mark that stands for safety, quality and experience. The item "2 Gallon Square Aluminium Foam Filled Fuel Tank Rally Race Performance OBPFT010" is in sale since Monday, December 09, 2013. This item is in the category "Vehicle Parts & Accessories\Car Parts\Air Intake & Fuel Delivery\Fuel Tanks". The seller is "optimumbalanceproducts" and is located in Nr Peterborough. This item can be shipped worldwide.